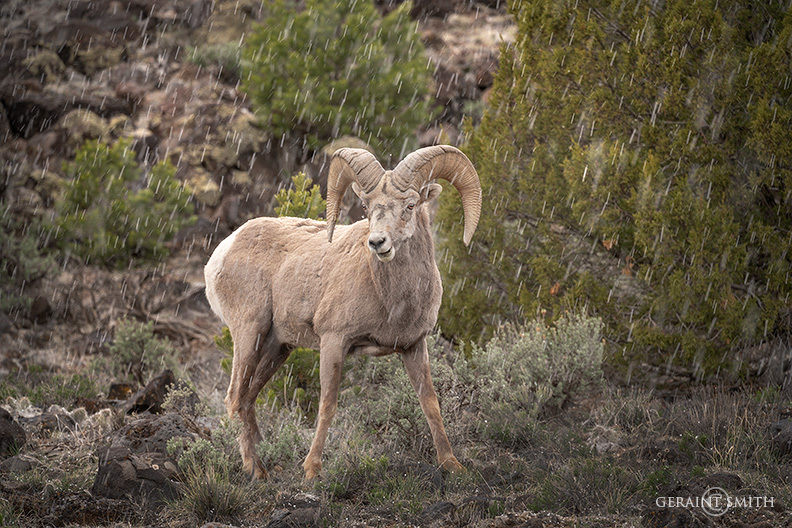 Bighorn sheep ram, in the Rio Grande del Norte National Monument. This is Mike Peddecord. You may remember us from our half day with you in Feb. 18. We were back again for another brief Taos trip. Seeing your bighorn made me think I should share my Big Horn photo from the top of Kachina Peak. This is a ski memory of a lifetime. This was the first day that the Kachina Peak chair had been open in a long time. Beautiful snow. I went up again after lunch and decide to get some landscapes from the top on this “bluebird” day. On the short hike up met several skiers who said there were big horns on top. I would have never expected this. What a thrill. Had my iPhone and Nikon AW110 point an shoot (photo in the google photos link below). We are sure to get back to Taos and perhaps will be able to connect. Do love your daily images and still don’t know how you find the time to post these. I never miss one. A gorgeous specimen. Beautiful photo. It really was an an amazing day! Still working on some images. Thanks, Geraint.